The Xyron system is an alternative to traditional adhesive and mounting products. Whether applying adhesive or lamination, the Xyron is the solution. It is an easy to use system which instantly applies adhesive, lamination, or both without heat or electricity. Simply insert the appropriate cartridge, feed in your artwork, then turn the handle and trim with the built-in trimmer. No smell, no mess, no waiting. The patented drop-in cartridges allow users to quickly switch between applications, making the Xyron dry mounting system the most versatile machine on the block. The Xyron system comes in several widths to accommodate the size of your finished pieces. The most popular unit for graphic artists is the 12" unit which allows art up to 12" in width to be fed into the system. Because the adhesive is fed on a roll, the length of most pieces of artwork can be accomodated. Other machine sizes available include the 25" width and the 44" width. If you are not familiar with the Xyron system, we'd be happy to arrange for you to have a demonstration of the unit. 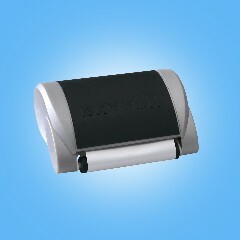 Cartridges are available in each of the three widths. For 12" widths rolls, laminate only rolls are 150' long; adhesive rolls are 100' in length. For 25" rolls, the cartidges come in 170' and 300' lengths. Adhesive cleaner and replacement blades are also available. The X4 Roll-On Adhesive is a handheld applicator that lets you apply a wide strip of acid free adhesive quickly and easily to a variety of projects. It holds a 50' refill of 4" wide strip of acid free, semi-repositionable adhesive. The unit is formed to fit in your hand so you can easily slide it over your artwork to apply an even coat of glue. Refills can be easily removed and added. The X4 Refill Cartridge lets you apply a 4" wide strip of acid free, 50' long repositionable adhesive quickly and easily to a variety of projects.